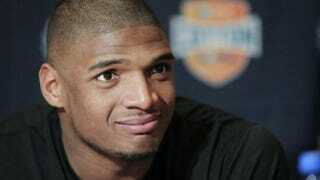 Just days after announcing that Oprah Winfrey’s OWN would chronicle Michael Sam’s every move for a documentary series, officials said Friday that the project has been placed on hold indefinitely, according to the Hollywood Reporter. Last week, Sam made headlines when he became the first openly gay player to be drafted by the NFL's St. Louis Rams in the seventh round. But the spotlight could get in the way of Sam's ability to accomplish his dream of making it onto the team, officials worry, according to the report. Cameron Weiss, Sam’s agent, agreed. But all is not lost. Sam has already garnered an endorsement deal with Visa and has the best record for jersey sales, second only to Johnny Manziel, also known as Johnny Football.